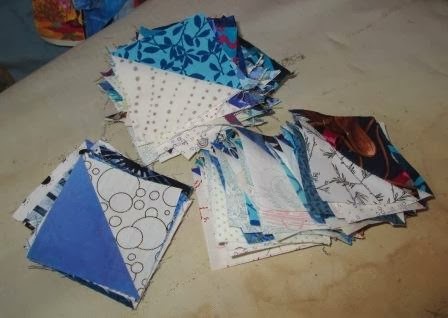 I have been working on my Blue scraps this month, Just not getting around to posting about it. 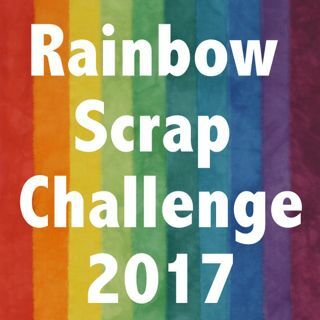 I am doing the Rainbow Scrap Challenge 2014. I did 2012 and 2013 yet I still have tons of scraps. If I run out I can cut some older fabric to add to the box. Bits of fabric like older fat quarters that are half gone. So slowly I will use up some of my stash too. So far I have a few of the blue sampler blocks done. The top right one is an extra I had the parts for. Some of the blocks are all blue and some have a neutral as the light fabric. I also have always had lots of 2 1/2" triangle around but was running short of Blue ones. I have an idea for a block or blocks but needed more 2 1/2" triangles, so I have made a few more. One of the block ideas I have, has more then just blue in it so I may not get to it right away, but the Blue Triangles are ready to go. 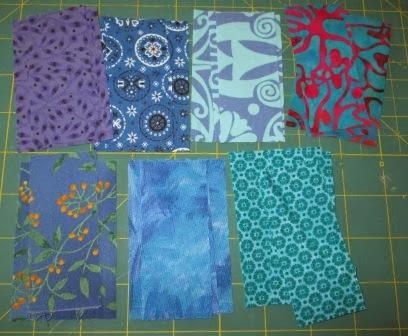 I also did some cutting for a few blocks I want to do but did not get them sewn yet. Maybe I can try for next Saturday. Till then they are cut and ready to start. I got this cool little pincushion as a gift over Christmas. 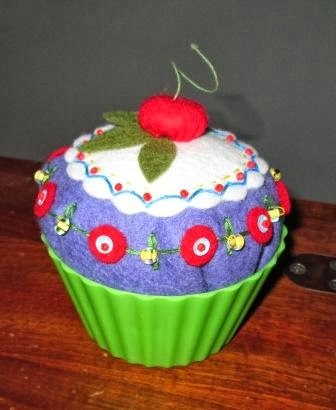 We did a pincushion exchange at the Leduc quilt guild and this is the one I got. Love it. Me and Gemma the day I picked her up. Just a warning that you may see lots of puppy photos in my blog this year. I am off to a Dog Agility trial today with puppy in tow. I will add this to the link for the Rainbow Scrap Challenge 2014 when I get home later today. I did the edit. Gemma is a cutie. We told our kids the youngest needs to be 6 before we get a dog - but I have a feeling we will be getting one sometime this year. Love your blue scraps. Hi, Cathy. Very pretty blue blocks. Every time I go to use up my scraps, I just create more--I don't know how that happens. It's magic! Cute puppy! 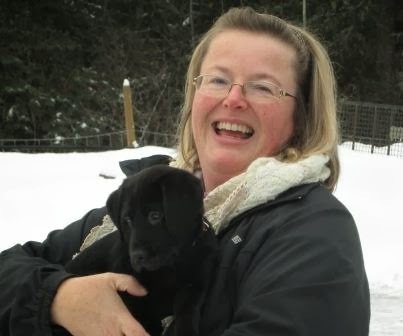 There might not be anything cuter than your black lab puppy! It's good to see you're still getting some quilting done, too. 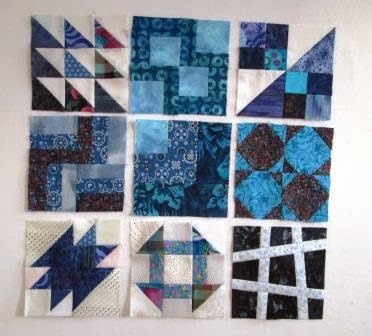 Great blocks, Cathy -- love the blue-and-white combos especially. Cute pin cushion and puppy -- and hairstyle. You've been growing it out! What a sweet new puppy. I like the longer hair! Great start on your blues. This is year number 4 for me and I'm not out of scraps yet either!